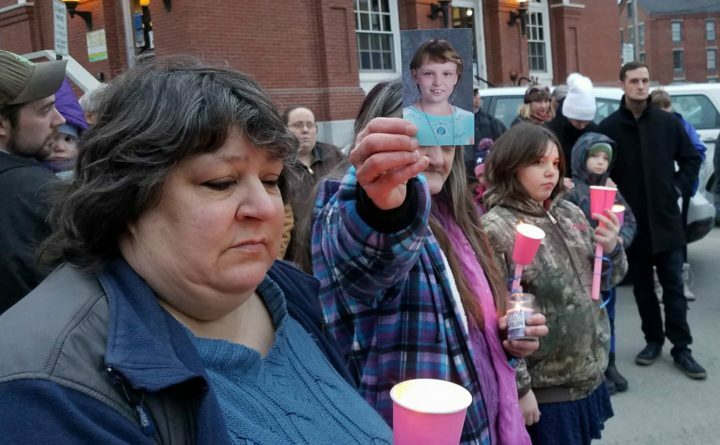 A photo of Marissa Kennedy is held up for a photographer by an attendee Saturday evening at a Belfast vigil to honor the life of the 10 year-old Stockton Springs girl, who police allege was killed by her mother and stepfather on Feb. 25. Lawmakers on Friday will decide whether to launch a probe into the state’s Child Protective Services division, in light of the recent beating death of 10-year-old Marissa Kennedy allegedly at the hands of her mother and stepfather. The Bangor School Department and the cleaning woman at the Bangor apartment building where Marissa and her family lived both say they reported suspected abuse to the Department of Health and Human Services, leaving many wondering what DHHS did — and didn’t do — to address a situation in which a child was clearly in danger. Gov. Paul LePage is already accusing DHHS of committing “a comedy of errors” in advance of Marissa’s death. The Legislature’s Government Oversight Committee will decide whether to assign its investigative arm, the Office of Program Evaluation and Government Accountability, to a Child Protective Services investigation. It must do so. Are abuse reports making it through to DHHS? In 2016, about 22 percent of the calls placed to the state’s child abuse reporting hotline weren’t answered. Callers either hung up before someone picked up or left a voicemail; to be sure, many likely called back to make their reports. Still, DHHS’ first step in addressing cases of suspected child abuse and neglect leaves a lot to be desired. The department hasn’t released statistics from 2017 to indicate whether intake workers have been able to answer more calls. Is DHHS receiving information that allows caseworkers to make informed judgments in suspected abuse cases? Last year, the then-director of the state’s Office of Child and Family Services told the BDN the office was changing the way it collected information from those reporting suspected abuse and neglect. It planned to have intake workers conduct structured interviews, instead of asking those reporting suspected abuse to deliver a general narrative. It’s worth exploring whether this change has led to improved information upon which caseworkers can act. How many more staff people does DHHS need? DHHS has clearly had trouble retaining staff in Child Protective Services. The department employed 115 investigators in 2016, down from 130 in 2010. High rates of turnover are common in Child Protective Services departments across the nation. Is DHHS in a particularly stressed situation now, personnel-wise? What is the department’s approach to intervening with families? Any probe should examine the policies — written and otherwise — governing how caseworkers react to cases of suspected abuse or neglect. Is the department at times more likely to remove children from their parents’ custody, and at other times less likely? What messages are caseworkers receiving from their superiors, and how are those influencing DHHS’ approach to abuse cases? What happens with active abuse cases when families move? Julio and Sharon Carrillo appear to have come to DHHS’ attention when the couple lived in Bangor. They later moved to Stockton Springs, which falls under the purview of a different DHHS regional office. How does the transfer of cases between offices work, and is there a risk of the department losing track of active cases as families move? Has a lack of permanent leadership affected the department’s approach to Child Protective Services? The Office of Child and Family Services, which oversees Child Protective Services, is DHHS’ second largest division, with 660 employees and a budget of $114 million in state funds in fiscal year 2016. But the office has been without a permanent director for nearly a year. Since Director Jim Martin left the department in April, the office has been led by an acting director, Kirsten Capeless. Has an office without a permanent director been less likely to receive the resources it needs to do its job properly? What’s the full scope of child abuse prevention efforts the department plans to disband? DHHS plans to stop funding the Community Partnerships for Protecting Children child abuse prevention program on Sept. 30. The initiative has been in place in a handful of Portland-area neighborhoods for about a decade and has more recently expanded to neighborhoods in Sanford, Bridgton, Lewiston, Rockland and Augusta with high rates of Child Protective Services involvement. To what extent has the initiative’s expansion taken place with so little time to implement such an intricate effort aimed at preventing child abuse in the first place? In other words, what state investment is being lost by the department’s decision to cancel a promising effort so early? With the stakes so high, the state needs a thorough investigation to answer these and many other questions.